One of the greatest concerns in treating patients with depression, anxiety and insomnia involves suicide. We know there is an increased risk of suicide in depressed patients but often global insomnia is under appreciated as a significant risk factor for suicide as well. Although safer than the older tricyclic and tetracylcic antidepressants, the current medications carry a significant risk of death in overdose, especially when combined with other analgesic medications. Too often, the medications we prescribed to prevent suicide become a means through which the patient attempts suicide. In addition, there are black box warnings that these medications may increase suicidal impulses, especially in adolescents. CES does not pose this risk. This entry was posted in CES v. Drugs on January 26, 2016 by cesadmin. Top international football stars are being offered electrical brain wave therapy to speed up their recovery from injury. Premier league side Everton have adopted the treatment, which is also used to treat patients suffering from depression. 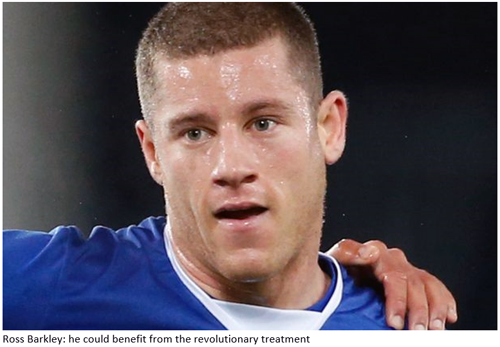 England stars Ross Barkley and John Stones are just some of the squad among first team players who can have the revolutionary treatment. 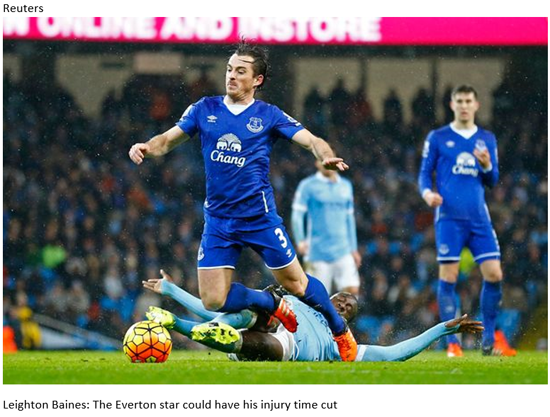 Other top players who can benefit include Leighton Baines, Romalu Lukaku and Gareth Barry. The mild electrical currents help players with pain relief and it helps cut recovery time from injuries by a third. It involves mild electrical pulses being delivered to the brain and injured muscles to stimulate the natural healing process. Earlobe clips or head pads deliver a mild current which helps the brain create the feel-good chemical serotonin which aids recovery. The pads are also be attached to muscles but the therapy works better by treating both the brain and the muscles together. Known as cranial electrotherapy stimulation it works by wiring up players to an machine which delivers Alpha waves to the different parts of the body. 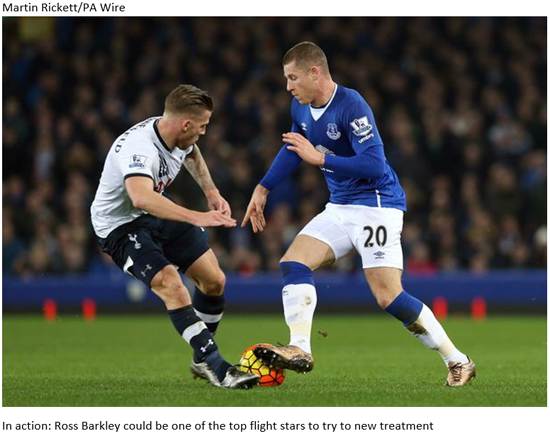 Everton is the only club in the UK to use the groundbreaking treatment. This entry was posted in Sport on January 25, 2016 by cesadmin. Currently, one tool investigators use to determine both underlying psychopathology as well as potential mechanisms of action of various treatments involves functional MRI (fMRI). It was my (Jason Worchel, M.D.) goal to apply this type of investigation to CES. With the assistance of Neal Rudtledge, MD, a neuroradiologist in Austin, Texas, we explored the safety of using CES in a fMRI environment. Using 30 foot leads, we attached a CES unit to a phantom head within a MRI. There were no noted adverse effects to the equipment or other unusual phenomenon noted. Subsequently, I used CES on myself while undergoing a fMRI study. There were no adverse events experienced with either the equipment or to me. Though we did not have the resources to conduct a full scale research study; i.e. design a specified protocol to ascertain specific effects and provide for blinding or placebo intervention, the process did confirm that fMRI appears to be a safe modality for the study of CES. This entry was posted in Psychopathology on January 20, 2016 by cesadmin. This entry was posted in Inflammation on January 6, 2016 by cesadmin.